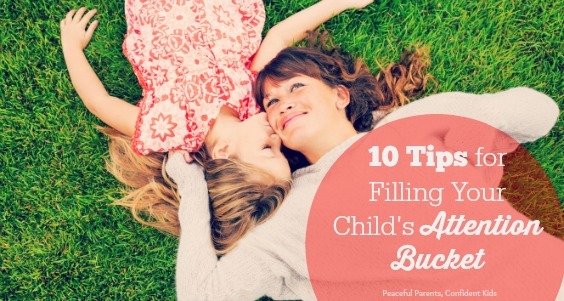 The basic premise of filling a child’s attention bucket is that every child is born with a figurative bucket that we must pour love and attention into everyday. When we hold, caress, nurture, touch, sing, play and provide loving attention, safety and care, we fill our child’s bucket. Magda Gerber taught a similar concept many decades ago. She proposed that being fully present with babies and children during care giving moments helped to saturate a child with a parent’s attention so that they may be happier to play independently of them at other times. This connection time is also important in creating a loving and trusting bond between parent and child, helping a child to feel secure in their environment. Gerber suggested that children need small periods of quality time with their caregivers outside of care giving moments each day to feel content to get on with their important work of play. 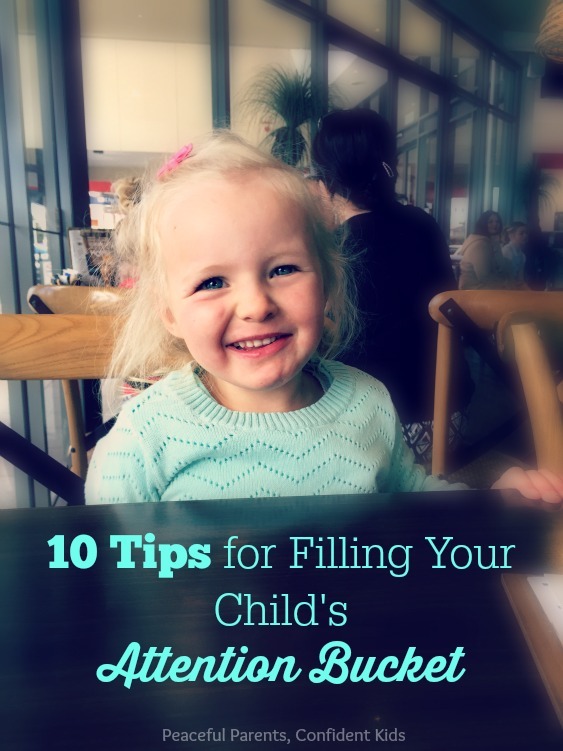 Here are 10 tips for filling a child’s attention bucket both through care giving activities and through mindful presence. A nappy change is a really intimate activity. Using a change table especially, sets us up physically to be able to speak face to face with our babies and connect with our children. Even without it, we can use this time to interact and enjoy our children one on one. Meal times are one of the few rituals we go through repeatedly through our life. Most days consist of three or more meals and generally these are held at roughly the same time and in the same place. Using this precious time to be fully present with children; telling stories, helping with their meals and simply absorbing their preciousness can give children just the boost they need to have their buckets overflowing with attention. Bath time is synonymous with fun time at our house. The kids love this time of their day. There are so many fun things to do with kids in the bath. Sing songs, play silly games, blow bubbles, make funny hair styles with shampoo, tell stories, read books, play bubble hide and seek with toys. There are just so many aren’t there? What’s your favourite bathtime activity? Share in the comments below. If your day is anything like mine, you have a mountain of things you’d like to be able to achieve by nightfall (or at least bedtime). There are some days when achieving everything is nigh impossible but sacrificing the first part of the day to connecting with the children really helps them detach and play independently later. Reading books is a beautiful and important connecting activity that your children will love. Magda Gerber called this “Wants Nothing” quality time. It is one of the most important bucket fillers for children. It is where we clear our minds of all other thoughts and simply sit and watch the children play; completely undistracted. No phones, magazines, washing, laptops; just you, them and their play. They may involve us in their play and that’s okay too. We can be puppets and they can be the master minds. We can drink their tea, drive their cars and hold their babies without adding extra or changing the course of their imaginations. Providing WNQT early in the day is helpful but if the children are being unusually clingy, whiney or seem to be having a hard time at any time of day, dropping what you are doing for 15-20 minutes and just sitting with them and observing their play can really help them find contentment. This works very well for us. Our Mummy – daughter dates are my favourite time of the week. My children are getting older and I really enjoy hanging out with them and learning more about them in our time together. The dates are not elaborate. They are simply pre-designated times where I get out of the house with one of the girls. The weekly grocery shop – I know this doesn’t sound like a date but when I involve my kids in writing the list and then let them help me find everything, slow the trip down to their pace, let them choose the vegies and pay the cashier etc, it becomes a really enjoyable time together. Dates are wonderful but they can’t happen everyday. Stealing 15 minutes of my daughter’s quiet time has really impacted how they approach their afternoon activities. Our quiet time does not really have a set time limit but it occurs everyday after lunch and last for around an hour. The children go into their rooms and I get some things done around the house. After about 30 mins I quietly enter one of their rooms and sit with them while they quietly play. I observe, and I participate when invited. My eldest likes to put on shows for me or have me read her a book. After about 15 mins I let her know I need to go and check on her sister and I leave the room. I then do the same for my youngest. She loves playing cars with me, brushing my hair or role playing Mums and babies. After about 15 minutes my eldest normally joins us in her room and I am able to leave them to it soon after. Their play is often transformed after having this small period of time with me. They are cooperative and enjoy role playing with each other for the rest of the afternoon. This is a really simple way to give the kids that little bit of daily one on one time that they crave. Spending time together outside is mutually beneficial as both parent and child can be reinvigorated by the fresh air. Also, the time spent together is high quality as there are less distractions from the volume of mess or cleaning parents need to attend to. At least once a day, we make a point to get outside. We love to walk around the block, chatting to neighbours, counting the numbers on letter boxes, collecting sticks, stones, leaves and flowers, observing cloud formations, colours and letters or telling stories as we walk. It doesn’t need to be long. 20 -30 minutes is a perfect amount of time to see the benefits of outdoor time with the children. This is great for older children in particular but there are many evening activities that can be done with young children also. Making it part of the week, gives everyone something to look forward to and forces the family to spend some quality time together. I’d love to hear about the games you love/d. Post your favourite family games in the comments below. I adore this and so do the children. That moment when the car ignition turns off and the world is peaceful is a lovely time to connect with children. I play peek-a-boo over the car seat, we pull funny faces together, sing songs, have a conversation in a made up language (this is silly but the kids think it’s hilarious. I say something silly like ‘Nu-no’ and then one of them will so ‘Ku-ko’ and I will reply with ‘Bai-na’ and so it goes on until we are all laughing. Sometimes we will sit and pretend we are sailing away or floating over a rainbow and point out all the imaginary things we can see. It only takes 5 minutes and free from the world of distractions, this little piece of time in the car is a perfect way to stop and connect with the kids. Give it a try. Finding some time everyday to slow down, connect, be present with and fill a child’s attention bucket is really important. Doing this without taking over a child’s important play time is the tricky part but once you are able to weave some of these ideas into your family rhythm, you will not only build connectedness into your relationships, you will find your children will have increased contentedness to play independently of you while you get things done around the house. Some lovely ways to connect with your child! We have a family games night once a week which the kids love and are always disappointed when we miss out. Blokus, Sleeping Queens and Doddle Dice would have to be our favourite games for the many different ages playing together. Oo, thank you Nichole! I have not heard of any of those games so am off to check them out now 🙂 I love that multi ages can play together. I love this. It’s hard to be fully present and mindful all the time which is why these pockets of opportunities are so important. Nature time is our favourite! Exactly, Racheous! Tiny pockets of undivided attention are better than a full day of divided attention. Nature time is the best! Thank you for coming by. This is an important reminder. I spend a lot of time with my kids but I don’t know how much of that is attention bucket filling. I think we can all get caught in that trap, Kate. Even being with the children, we are often thinking about what’s for dinner, what chores still need doing etc. It is difficult to truly clear our minds and be present with the kids. Thanks for coming by. Beauitful! 🙂 THanks for sharing!! Thank you, Kylie. I’m so glad you liked it. There are so many wonderful ideas here. Just the slowing down and putting chores and things to get done to one side and putting the kids first. This really resonated and I will definitely try some of the ideas. So helpful. This article came up in my Pinterest feed, and it wasn’t until I opened it that I realised who the blogger was! We recently got a board game called Whatever Next. It’s the perfect board game for our family right now (7yo & 4yo). It’s a basic roll-the-dice-and-move-that-many-spaces game, but there are 4 different coloured squares you could land on. If you land on blue, you pick up a blue card, which instructs you to pretend something… Members of our family had to pretend to be a butterfly, tonwash someone’s stinky feet, to eat slimy spaghetti, to ride a rollercoaster… If you act it out well enough for the other players to guess, you move forward 2 spaces. If you land on pink, you pick up a pink card, which challenges you to do something: leave your arms folded until it is your turn again, stay silent until it is your turn again, get up off the floor without using your hands, do a handstand… If you are successful you get to move forward 2 spaces. If you land on red, you pick up a Chance card, which might say, “If you are in the lead, move back 5 spaces. If you are at the back, move forward 5 spaces. The game was a great feel-good bonding experience with lots of laughs! For our pre-reader, an adult would read the instructions to her. Each card has 2 options (an easier one and a more challenging one). Hi Jo, I only just came across your comment now and was wondering how I missed it. Then I noticed that the date was 2 weeks after baby no. 3 was born last year. Thanks for the tip on that game. I think my girls would really love it and after having played junior monopoly on repeat for the past 4 months, I think it is time for a change. Thank you for the suggestion!! Hope you are all well! I am struggling with quality time with my 20 month old. We live in an apartment without a garden and I try to get to our local park as often as possible so he can have freedom to run around and he seems happy when we are there. However, at home he doesn’t play independently. If I sit with him, he sort of just sits there or whines. And when we have meals together, he just tests and demands. I come from a family that entertains their kids although this, for some reason, doesn’t come naturally to me. I feel there are no moments of connection with me and my son and without resorting to entertaining, I don’t know how to make things better especially at home when we need to be there. I know this is an old post but I hope you have time to read this.